November is zooming by with the winter months quickly approaching. Leaves are crunching under our feet and the rain has filled our streams. 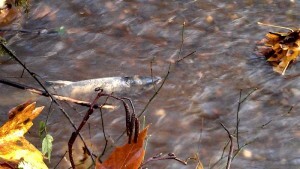 With the rain the salmon have arrived! Come watch the salmon while they’re still spawning! Visit Kennedy Creek this Saturday November 17th from 11am – 2pm! Take a stroll through the fall trail. Watch the salmon swim and spawn and warm up with hot chowder, coffee, cocoa, and treats! Visits are free, but donations are appreciated and go directly to supporting the trail. Don’t miss your opportunity to see the salmon! With November coming to a close, so will the salmon. Hope to see you all this Saturday at Kennedy Creek!